There are two subspecies of Hermann’s tortoises. The western subspecies (Testudo hermanni hermanni) is found in eastern Spain, southern France and throughout Italy. The eastern subspecies (Testudo hermanni boettgeri) is found in Croatia, Romania and as far east to Turkey. The eastern subspecies at 6-8 inches is generally 1-2 inches larger than the western subspecies. Keeping this tortoise in captivity is relatively easy as long as certain needs are met. If you plan to keep your tortoise indoors, you should provide as much space as possible. 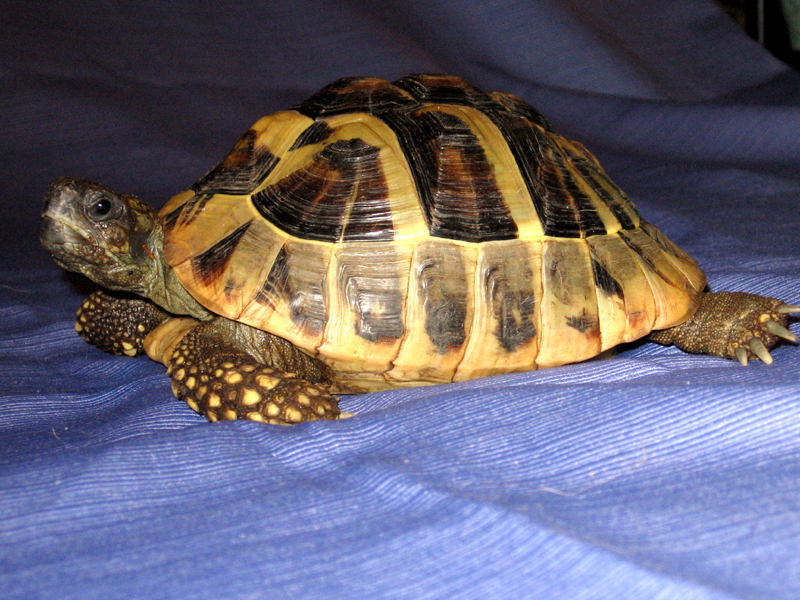 A 30 gallon breeder tank or larger would be sufficient for one adult tortoise. For a hatchling and up to 4 inches, a 20 gallon long tank would be sufficient. Next you will need to provide proper lighting. UVB lighting is very important and should be on approximately 12 hours each day. This allows the tortoise to naturally produce Vitamin D3, which is needed for proper shell growth. In order to keep the proper temperature, a 60- watt bulb placed at one end of the enclosure (on the top edge of tank) and a heat pad placed under the tank should be adequate to maintain a temperature of 80º-90º F during the day. A nighttime temperature between 60º and 70º F is sufficient. Substrate is also important. A good choice would be timothy or alfalfa hay. Another choice would be cypress mulch. It’s best to have your tortoise’s “home” set up before you bring him home. When it comes to feeding your tortoise, the key word is “variety”. It’s very important to feed him a wide variety of leafy greens and vegetables. If you are keeping only one or two tortoises, it’s not practical to buy six or seven different kinds of greens or veggies. It’s okay to give them chicory one week, escarole the next week, collard greens the next week and so on. Besides these three greens, you can feed them kale, turnip greens, dandelions and mustard greens. If possible use organic or homegrown. Rinse all foods to wash away any insecticides that may be left on veggies. Do not feed them much fruit, as this can lead to diarrhea or digestive problems. A high fiber diet is important. Grape and mulberry leaves are a good source of fiber. Vitamin and calcium supplements should be added to their diet once every five to seven days for adults. For hatchlings the supplements should be lightly sprinkled every day. Water should be made available every day in a shallow container. Change the water daily because the tortoise may have urinated in it. If you decide to raise your adult tortoise outside, GREAT! This is a more natural environment and eliminates the need for supplemental UVB light, heat pad, substrate and vitamin D3 supplement. However when you build your tortoise pen, make sure it is escape proof and it protects your tortoise from dogs, raccoons, etc. Be sure it’s located in a sunny area and a minimum of 8’ x 8’ for one or two tortoises. Don’t forget to provide a shady spot. This is just the basic care information for Hermann’s tortoise. For more information see the suggested readings below. Highfield, A.C.; The Practical Encyclopedia of Keeping and Breeding Tortoises and Freshwater Turtles. If you have additional questions about corn snakes or rat snakes try to attend one of the LIHS monthly meetings. You can e-mail us at info@lihs.org or write or call the LIHS at the address/phone number at the top of this sheet. Reading about your snake before buying it is always beneficial.